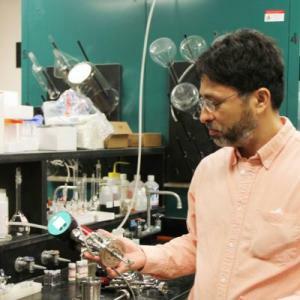 The U.S. Department of Energy's Ames Laboratory has created a faster, cleaner biofuel refining technology that not only combines processes, it uses widely available materials to reduce costs. The method is a departure from the established process of producing biodiesel, which is accomplished by reacting fats and oils with alcohols. "Conventionally, when you are producing biodiesel from a feedstock that is rich in free fatty acids like microalgae oil, you must first separate the fatty acids that can ruin the effectiveness of the catalyst, and then you can perform the catalytic reactions that produce the fuel," said Ames Lab scientist Igor Slowing. "By designing multifunctional nanoparticles and focusing on green diesel rather than biodiesel, we can combine multiple processes into one that is faster and cleaner." Contrary to biodiesel, green diesel is produced by hydrogenation of fats and oils, and its chemical composition is very similar to that of petroleum-based diesel. Green diesel has many advantages over biodiesel, like being more stable and having a higher energy density. An Ames Lab research group, which included Slowing, Kapil Kandel, Conerd Frederickson, Erica A. Smith, and Young-Jin Lee, first saw success using bi-functionalized mesostructured nanoparticles. These ordered porous particles contain amine groups that capture free fatty acids and nickel nanoparticles that catalyze the conversion of the acids into green diesel. Nickel has been researched widely in the scientific community because it is approximately 2000 times less expensive as an alternative to noble metals traditionally used in fatty acid hydrogenation, like platinum or palladium. Creating a bi-functional nanoparticle also improved the resulting green diesel. Using nickel for the fuel conversion alone, the process resulted in too strong of a reaction, with hydrocarbon chains that had broken down. The process, called "cracking," created a product that held less potential as a fuel. "A very interesting thing happened when we added the component responsible for the sequestration of the fatty acids," said Slowing. "We no longer saw the cracking of molecules. So the result is a better catalyst that produces a hydrocarbon that looks much more like diesel. " "It also leaves the other components of the oil behind, valuable molecules that have potential uses for the pharmaceutical and food industries," said Slowing. But Slowing, along with Kapil Kandel, James W. Anderegg, Nicholas C. Nelson, and Umesh Chaudhary, took the process further by using iron as the catalyst. Iron is 100 times cheaper than nickel. Using iron improved the end product even further, giving a faster conversion and also reducing the loss of CO2 in the process. "As part of the mission of the DOE, we are focused on researching the fundamental science necessary to create the process; but the resulting technology should in principle be scalable for industry," he said. The process is discussed in a paper, "Bifunctional Adsorbent-Catalytic Nanoparticles for the Refining of Renewable Feedstocks" published in 2013 in ACS Catalysis, and also in "Supported Iron Nanoparticles for the Hydrodeoxygenationof Microalgal Oil to Green Diesel" published in May 2014 in the Journal of Catalysis.